Lake Horn, Mississippi to Athens, Alabama – Let's Go RVing! 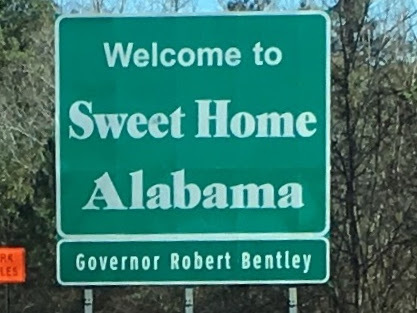 We slept until after 7:00, got up had coffee, showered, secured everything and were on the road at 9:21 traveling US-72 to US-31, 173 miles to Athens, Alabama our stop for the night. It was a pretty day in Lake Horn at 59 degrees and breezy but got cloudy as we traveled. Before we left Jerry chatted with the next door neighbor while I finished getting dressed. He and his wife are from Michigan. They spend the winter in Destin and then return to their home in Michigan for the summer with a stop in Lake Horn to visit with their son. He suggested Lake Mackinac for our summer trip. I had actually looked that up the other night. Might be a possibility. Late April is a pretty time to be traveling in the south. Everything is so lush and green with a few sprinkles of color here and there as flowers are beginning to bloom. We took a brief detour as both GPS’s sent us on a wild goose chase. Thankfully it was brief and we were soon back on Hwy 72 headed to Athens. Two brief breaks for Jerry and a chance to check the tires on the car. Unfortunately for us we’ll still be on Central Standard Time tonight. Ready to get back into our time zone! We arrived at North Gate RV Travel Park about 1:45 and by 2:20 we were set up and eating lunch. Interestingly enough the guy who checked me in told me he had never heard of a Canyon Star before and then we realized that we are parking right next to one. Funny. This is a very small campground, seems to be very quiet, graveled sites, apparently good Wi-Fi and a great place for an overnight travel stopover. We don’t have cable but we have no obstructions so our Dish connected easily. Maybe we can watch the news tonight and catch up our local news. After lunch we watched Fox News for a while to get caught up on the riots in Baltimore then took a brief walk around the campground. We don’t want to take the car off of the dolly so we’re pretty much here for the afternoon. Clouds are gathering and there’s an 80% chance of rain so I guess we’re in for the day. Reading, napping, eating – what a life.